As Queen Mary’s College celebrates its Centenary, we came across this recollection of the College and its hostel food in the 1940s. This is in a memoir titled Tiffin* (a recollection of her life as well of recipes of the tiffin items she had enjoyed) by Rukmini Srinivas. These excerpts are published with her permission. 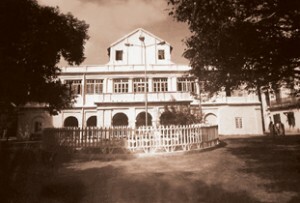 In the summer of 1946 I joined the liberal arts and humanities department of one of the country’s premier women’s institutions for graduate studies, the Queen Mary’s College in Madras. Capper House, where Queen Mary’s College had its beginning. I took the train from Poona to Madras Central Station, where my mother’s cousin met me in the early hours of the morning, gave me an early breakfast and put me in a cycle rickshaw, handing me a sheet of paper with handwritten directions to the college. The two black trunks containing my personal belongings were loaded on to another rickshaw, and I left for my college and new ‘home’, the college hostel, with trepidation. Soon, I was at the imposing gates of the college on Beach Road, overlooking the sandy Marina with the fishermen’s boats setting out for the day towards the brilliant sun. The Bay of Bengal was shimmering calm that morning. Little did I know that with the onset of the torrential monsoons, the stormy waves would drive the sea into the college campus. I liked what I saw when I entered the gates. A canopy of rain tree branches spread across the driveway and a well-laid-out rose garden on the lower terrace of the campus was in bloom. On arrival, every student had a brief interview with Miss Myers, the principal (and hostel warden, of the college. I was nervous about the interview but Miss Myers allayed my fears. 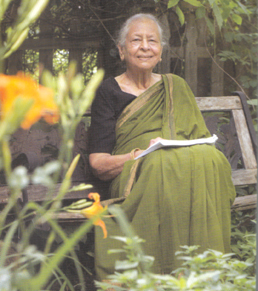 She was the spitting image of Miss Levy, my English teacher whom I adored at the Christ Church School in Jubbulpore. She asked me a couple of questions about my parents and my family, and wished me well in my studies and for my stay in the hostel. I was South Indian and Tamilian, and Madras should have been ‘home’ to me, but it was not. I generally found people, including many of my classmates in college, conservative and caste conscious. Poona, by comparison, was cool and liberal. Women had more freedom in Poona, where girls and women rode bicycles to school and work. Though I had brought my bike with me, I rarely felt comfortable riding it in Madras. To add to the feeling of being an ‘outsider’. I also missed the comfort of familiar home-cooked food. Queen Mary’s College had an excellent reputation for academics, but the hostel food was indifferent in quality and the atmosphere of the dining room uninviting. There were two divisions in the hostel mess: the crowded, noisy ‘vegetarian mess’ and the orderly ‘non-vegetarian dining room’. A vegetarian by upbringing, I preferred to join the vegetarian mess. Soon I realised that more than two-thirds of the hostel inmates had joined the vegetarian mess even though many preferred non-vegetarian food. They had their reasons. Many in the hostel referred to the food served in the non-vegetarian dining room as ‘English food’, which translates to omelette and toast for breakfast instead of idli and dosai. They were also uncomfortable with the formality of the dining room and the conversation was mostly conducted in English. They decided they were not going to pay for the tables with table cloths, vases with flowers and uniformed bearers. In comparison, the appearance and atmosphere of the large rectangular vegetarian dining hall was chaotic and unappeatising. Six long rectangular wooden tables were arranged parallel to each other and students sat on wooden benches. The dining hall could seat only about forty students at a time, and there were several batches at every meal. There was an unwritten hierarchy among the students – our seniors dined before us. The first two batches of students dined at cleaner tables and the food was hot. The Malayali cooks and servers looked exhausted and overworked; thus, order and cleanlines were very low priorities for them. One of the resident staff did try to improve matters, but the numbers were so large that it was a no-win situation. The weekday lunch and dinner in the vegetarian mess was ill-planned. On most days, it was potatoes in one form or another. Green vegetables were a rarity. After the third week of the first term, in my first year in college, Krishnan Nair, an avuncular man in his forties and the head cook in the vegetarian mess, noticing that I ate very little, came up to me and advised me on the importance of eating well – he meant more – in order to be able to study. I told him I did not like the food served for lunch and dinner and that I preferred the breakfast menu. I still remember the weekly breakfast menu – idlis, with coconut chutney and sambar, dosai with potato curry and chutney, uthappam, rava dosai with coconut chutney, semolina upma, wheat polenta, appam with vegetable kurma stew, and poori with potato curry. My favourite breakfast was the spongy, frilly edged appam that came with the creamy mixed vegetable kurma, with the vegetables disintegrating in a thick, spicy, coconut milk sauce, and pooris with a potato curry. Krishnan Nair treated me to one more appam and two more pooris than was my share. I would eat heartily at breakfast and deliberately miss lunch. I found no variation or variety in the menu for lunch and dinner. The staple was boiled rice with one dry vegetable curry, sambar with a few vegetables, rasam, buttermilk and, on some days, appalam. Dessert was served on Sundays and festival days – fruit salad and ice cream on Sundays and payasam on festivals. After the eclectic fare in my parents’ home, I found the hostel menu boring and the food poorly cooked. In my second year in college, Krishnan Nair suggested that I volunteer as a member of the vegetarian mess committee so that I could have some clout in suggesting changes in the menu. I was not reluctant to take on the extra work involved in the membership. In fact, I enjoyed going to Kotwal Chowadi market, the wholesale vegetable and fruit market, with Krishnan Nair once a week, wandering among the mountains of vegetable sacks and fruit baskets. I introduced more vegetables into the menu and started eating better. I also introduced a more substantial evening tiffin, of appam with kurma and poori, and with potato curry instead of the two biscuits or two bajjis that the then existing menu provided. The result was an increase in the mess bill, which made me unpopular with some of the students who protested, threatening to stage a one-day hunger strike. It was a delicate balancing act for me between good food and capping the mess bill at the end of the month. Fortunately, this was sorted out without compromising on the quality of the food, and I was re-elected to the student membership for the next few years of my stay in the College. Once I had settled down in my college, I started bonding with the nine other girls in the large dormitory. I learned that all, except one, came from small towns near Madras. Sushma Kutty, from Trissur in Kerala, and I were the only two from outside Madras Presidency. None of them had heard of Poona. A couple of days later, I shifted to wearing a saree, which helped me blend with the student community in the college. Ten days later at a hostel meeting, all the new entrants to the intermediate. BA and BSc courses were allotted tutors and rooms. The tutors were responsible for the good behaviour and academic performance of their wards. They assumed the role of surrogate parents. My tutor, Mrs. Mandakini Bai, was the chairperson of the Hindi department. She was benignly firm and helpful. She was fond of me, maybe because of my fluency in speaking Hindi and, unsuccessful though, had tried to get me to transfer to Hindi from French. I was allotted a room on the first floor in Stone House Block – a room for two – and my first room-mate was Juliet. I found, when I entered my room with two trunks and a hold-all, she had already unpacked and waiting to see who would share her room. I remember her as being short in stature, just about five feet tall, with a tanned complexion, curly-haired and stockily built. I was very impressed that she could lift my trunks without much effort. As we got talking, I learnt that her parents lived in Tanjore, which was another reason to bond with her. Juliet and I shared a room for the first year after we joined college in the intermediate class. Over the first couple of weeks, we became good friends, and though the hostel room was small and cramped with two chests of drawers, two writing desks with straight-backed chairs, and two beds against each wall, and hardly any room to move, each one of us had managed a space of our own. Juliet was very adjusting and, as I realised soon, caring too. When my younger sister Sarasa also joined Queen Mary’s College in 1947, Juliet helpfully moved to another room in the same block and on the same floor, and we continued to be friends. She left Queen Mary’s College at the end of the second year when she joined the Vellore Medical College and, sadly, thereafter I lost all contact with her. I continued to stay in the students’ hostel for the next three years till I completed the Bachelor of Arts (Honours) programme in Geography.